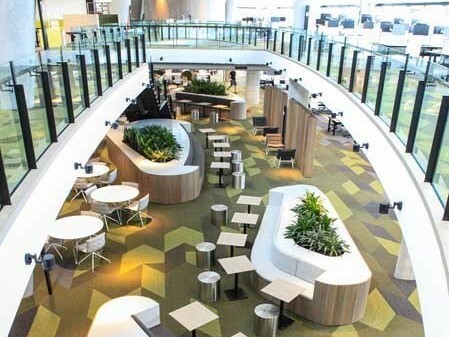 Maxton Fox Furniture Systems was engaged to design, manufacture and supply several products for the fit-out of Fire and Rescue NSW’s new $21M headquarters, helping create a stylish and safe working environment. Maxton Fox collaborated with architect Group GSA to provide a fit-out plan that met several aesthetic, functional and WHS objectives. Maxton Fox designed and developed a range of bespoke items to meet Group GSA’s design concept for the new NSW Fire and Rescue headquarters. Custom seating, laminate panels for custom items such as lockers and plant boxes, benchtops and bathroom vanities, timber joinery for breakout spaces, and custom upholstery for all seating were designed to meet the comfort and functional goals of the NSW Fire and Rescue staff, while perfectly fitting into the HQ’s size and aesthetic requirements. Maxton Fox’s manufacturing facility provided the flexibility to both manufacture products as well as tailor sourced products. Bespoke kitchens, bench seating, lockers, and a reception counter were made-to-order by Maxton Fox’s specialist design team and manufactured in their warehouse to ensure efficient installation. Maxton Fox used Corian to design, manufacture and install bespoke benchtops on both levels of the NSW Fire and Rescue building. Maxton Fox designed and manufactured bespoke bench seating and plant boxes for the breakout areas. The scope also included timber joinery for the plant boxes and tailored upholstery. Bespoke locker units were designed and manufactured to accommodate the special equipment storage requirements of the NSW Fire and Rescue staff. Maxton Fox created a bespoke reception counter for NSW Fire and Rescue’s reception area to provide an impressive and welcoming vibe. Maxton Fox collaborated with Group GSA to create custom stone vanities using Corian for the bathrooms. To meet the requirement for functional, yet unique staff collaboration spaces, Maxton Fox provided custom made, circular mesh walls attached to metal supporting structures. Maxton Fox supplied the Leader sit-to-stand workstation, an Australian designed and engineered system with the strength and adaptability to allow workplace flexibility and uninterrupted workflow. Backed by over 40 years of research and development, the innovative design provides agile, user-friendly work environments for office staff. The brief given to Maxton Fox by the client sought an engaging and comfortable environment based on the Activity Based Workspace (ABW) concept that encouraged agile work interactions. Seating solutions were carefully selected from Maxton Fox’s extensive product range while their in-house manufacturing capabilities ensured the chairs could be custom upholstered to meet the designer’s aesthetic requirements for the designated workspaces. Maxton Fox’s team selected puffy chairs and lounge chairs (manufactured by Maxton Fox) to provide sophisticated seating for the breakout areas; Charles boardroom seating with its sleek, minimalist design; Polar outdoor seating for a subtle, versatile, and highly element-resistant addition to the outdoor areas; and Arina chairs (manufactured by Maxton Fox) for a versatile chair that fits into a range of spaces. NSW Fire and Rescue’s new headquarters provides the staff with comfortable boardrooms, engaging collaborative workspaces, and relaxing indoor and outdoor breakout areas. Maxton Fox’s ability to offer a design team capable of meeting the rigorous WHS requirements of a government entity, bespoke furniture prototyping, design and development, and onshore manufacturing and tailoring of imported products were some of the reasons for their selection by NSW Fire and Rescue and Group GSA.